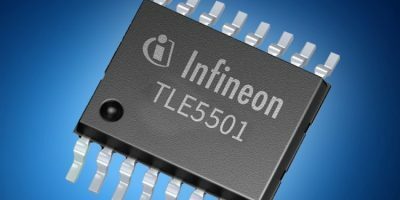 Infineon Technologies’ TLE5501 XENSIV TMR sensors are claimed to offer the highest automotive safety level, ASIL D, on a single chip. The TLE5501 Xensiv magnetic sensor is now stocked by Mouser Electronics. They are Infineon’s first magnetic sensors based on tunnel magneto resistance (TMR) technology and are designed for automotive brushless DC (BLDC) motor commutation in devices such as wipers, pumps, and actuators, as well as for steering angle sensing and integration in electric motors. There are two versions of the AEC-Q100-qualified Infineon TLE5501 Xensiv magnetic sensors. The E0001 version is pin-to-pin compatible with Infineon’s TLE5009 angle sensor. The E0002 model is compliant with ISO 26262 standards for increased functional safety. It is also the first to achieve the highest automotive functional safety grade for angle sensors, ASIL D, with just a single sensor chip. The TLE5501 sensors offer direct microcontroller connection through powerful output signals of up to 0.37V per V (V/V). The high output voltage allows them to be used without an additional internal amplifier, providing a low power, low-cost solution when connected directly to the microcontroller. The sensors feature a supply current of approximately 2mA and a magnetic field range of 20 to 100mT. The devices also feature a discrete bridge with differential sine and cosine output. While both sensors offer a typical angle error of only one degree over the entire temperature and lifetime profile, the E0002 device offers higher diagnostic coverage and redundant external angle calculation through the use of decoupled bridges. In addition to automotive safety applications, the TLE5501 XENSIV magnetic position sensors are suitable for industrial applications, including robotics and automation. Mouser claims to stock the world’s widest selection of the latest semiconductors and electronic components for the newest design projects. Its website is continually updated and offers advanced search methods to help customers quickly locate inventory. Mouser.com also houses data sheets, supplier-specific reference designs, application notes, technical design information, and engineering tools.